Finally! 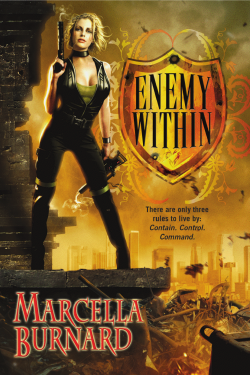 Debut author Marcella Burnard’s science fiction romance ENEMY WITHIN is out this month and available for our reading pleasure. This RT Book Reviews “Top Pick” is garnering good buzz and was also nominated for best futuristic romance in RT's 2010 Reviewer Choice Awards. From what I’m seeing, it’s a highly anticipated book. I know I’m excited. The Galaxy Express: Tell us a little about yourself. When did you know you wanted to become an author? Marcella Burnard: Given that my actual degree is in acting, I don’t suppose I ever really thought I could become an author. Writing was simply something I did to stay sane. Ish. When I finally connected all the dots of my various interests (yes, I was even a medieval minstrel for awhile) I realized story telling was the common thread and that writing had become as necessary as breathing. My husband urged me to begin submitting short stories. My first rejection letter was from Marion Zimmer Bradley. Many more rejections, from far too many other people, followed. A coworker invited me to an RWA meeting and the bug really bit. So did the learning curve. As for me, I’m a geek. Used to lament the fact – desperately wanted to NOT be a geek, but I think the condition is terminal. D&D, comic books, World of Warcraft, cats, boats, tea, making up stories. I’m the one wearing black covered in cat hair. TGE: In your bio, you revealed that films like “…The Omega Man, The Fly, and The Incredible Shrinking Man” influenced your interest in science fiction and fantasy. Where does the romance part come in? MB: Romance had to sneak in. For the longest time, I swore I disliked romance. Then I read a few and realized that several authors set me up to value a good love story: Andre Norton. Anne McCaffrey. Charles de Lint. Robin McKinley. Oh. And too many over-the-top action/adventure movies from the 70s and 80s. H.M. Hoover wrote some dark, dystopia YA books that I loved, and again, while they weren’t romances, relationships transformed people in those books. That’s what stuck with me – that it isn’t often circumstances that transform someone - it’s relationships that do. It finally dawned on me that precious few people redeem themselves simply because they want to – they redeem themselves for someone they love. A book called Deep Survival emphasized again and again that the people who survive disasters when everyone else dies all had someone to live for. That makes a relationship one of the most powerful of human interactions. TGE: Tell us about the inspiration for your debut novel, ENEMY WITHIN. MB: I wish I knew. I think the seeds were sown years ago. A friend’s husband served two tours of duty in Iraq. When he came home, the PTSD was so severe; he couldn’t sleep unless it was in the bathroom floor with the shower running. That struck a chord, I guess. The ‘what ifs’ started flying. What if a heroine has PTSD and yet has to operate around it in order to save her family and friends? How would the people around her take advantage of her Post Traumatic Stress to achieve their goals at the expense of hers? Then scenes and confrontations began popping into my head. It was over. I had no choice at that point but to write the book. TGE: What was the path to publication like for this book? MB: Charmed. Really. I’d sent queries out to the few RWA listed agents who accepted science fiction. Three asked for the first three chapters and synopsis. One agent asked to see the full. This was Good Friday. Easter morning, my mother called in tears because one of her cats had gotten out of the house and was missing. Off I went in the pouring rain to hunt for Nicadeimos. We didn’t find him. I am a crazy cat lady, descended from a long line of crazy cat people. I’d adopted Nicadeimos from the Humane Society (though it became obvious that he idolized my folks, so I was merely a stepping stone in the boy finding his right home). That adoption was ‘til death do us part. I wasn’t ready for that death to be *that* day. It was long after dark before we had to call off the search. Then at 9am, my phone rang again. I didn’t recognize the number. I answered with that deep, dark, forbidding voice you reserve for people trying to shill ‘let us help you refinance your mortgage!’ schemes. A nice, cheery voice asked for Marcella. Huh. Usually the refinance shills don’t get my name right. Or at all. My brain stalled. Did I know that name? Should I know – ? A single neuron resumed firing. Wait…the agent you queried – the one who asked to see the full. My heart stalled. She *can’t* have read the entire thing over the holiday weekend. Right? She had. And she’d liked it. Emmanuelle offered to represent me. I was thrilled and accepted. Her phone call to tell me Berkley wanted to buy the book had to have been a disappointment…I live aboard a sailboat. I haul my backside up to the shore-side showers each morning (why shower aboard where I have to clean up when for a few quarters, I get a shower and someone else has to clean the bathroom). I’d just stepped into the shower as a matter of fact, when Emmanuelle called. I hopped, dripping, out of the shower, grabbed my phone and my towel, in that order and had to restrain my reaction because there were two other women in the building…who commented in disapproving tones that one ought to be able to get away from the phone long enough to shower at least. I wanted to scream at them that I’D WANTED TO BE PUBLISHED MY WHOLE LIFE! The shower could @)*%) wait! Oh. The cat. Mom did set up a humane trap. Exactly one week to the day after he’d gotten out, he walked into the trap and got to go home. Happy endings all around. TGE: If Ari made up a haiku about Cullin when she first meets him, what would it be? MB: I will get you for this if it is the last thing I do. I’m going to have to get this printed on a t-shirt now, you know. Lethal tempered work of art. TGE: Without spoilers, what type of universe/setting did you create for ENEMY WITHIN? TGE: What is Cullin’s coolest pirate accessory? MB: Oo. That’s tough. His charm? His ability to manipulate? His secrets? The figurative aces up his sleeves? Intel. I’d say definitely the intel. It’s what gives him his edge. At least until Ari agrees to ally with him. MB: Firefly. Hands down. At the time, it was the best writing on TV while it lasted. Loved the first and second seasons of Farscape, but then they lost their writers and…it pains me to speak of it. Of course I loved the Star Wars movies (Original, Empire and Jedi – the others changed the rules so much, I count them a separate trilogy in a separate universe. My own bias.) Books…I enjoy Linnea Sinclair’s books a bunch. Hers were actually the stories that convinced me to put aside UF and give SFR a shot. 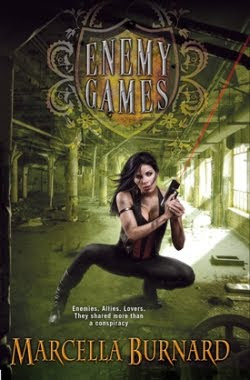 TGE: Can you give us a sneak peek of any kind for ENEMY GAMES (Spring 2011), the next book in the series? MB: That’s Jayleia’s and Damen’s book. They think they know who and what the enemy is. They’re wrong. TGE: Is there anything else you’d like to share about ENEMY WITHIN, or science fiction romance in general? MB: I am SO lucky I get to write science fiction romance. I love seeing all of the different permutations of SFR – all the opinions on what it *should* be. It’s fun indulging in so many other worlds and realities. Yes. I do have my own notion of what makes an SFR science fiction romance rather than futuristic. In SFR, I’d like for science to play a role in resolving the external conflict (bonus points if it resolves the internal conflict, too – but that’d just be showing off), otherwise, the science part of the fiction is little more than a prop. Who was it who said: If there’s a pistol over the mantle in act one, it had better be fired by the end of act three? Ms. Burnard, thanks very much for your time, and for your art. For more information about the author and her work, visit Marcella Burnard's blog. You can also follow her on Twitter (marcellaburnard). By the way, I’m first in line for the t-shirt.